A full range of Industrial Scales are now supplied by Get Packed from small digital bench scales through to pallet weighers and dual platform scales. Read here for a brief description or look under our General Packaging Section for more details and pictures of each Industrial Scale. 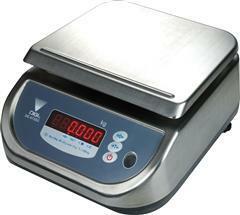 Stainless Steel Bench Scale - is legal for trade use with a large easy to read LED display. Series Scales - durable stainless steal platform is fast and easy to read. Heavy Duty Couting Scale - made of aluminium alloy platform construction which features overlaod protection, detachable indicator for wall mounting, accumulation memory for weight and total count as well as negative sampling. Weigh Bar System - ideal for odd shaped or oversized articles due to its two galvanized weigh bars. 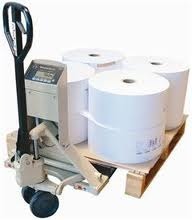 Pallet Weigher - has a robust trolley design with a built in fully seaaled hydrolic lift. Single Frame Platform Scale - ideal for industrial applications and forklift loading with a low profile heavy duty tubular frame. Dual Frame Platform Scale - also ideal for industrial applications and forklift loading with a low profile, 12 heavy duty stops and up to 400% overload protection. Trolley Type Platform Scale - manufactured with a convenient roll-on / roll-off design with a fully galvanised platform with side bars.